Registration Forms Available at the St. Mary's Rectory. Interested participants can also register online through Eventbrite HERE. What is Gael Scoil? 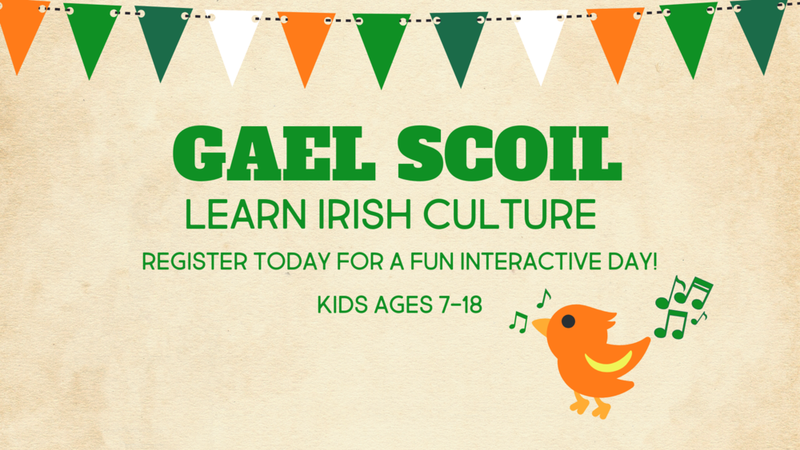 Gael Scoil is an immersive experience designed to help young people grow in knowledge about Ireland and Irish culture. It is open to young people ages 7-18. We aspire to engage others through active participation by partnering with area community members to offer exposure to traditional Irish activities. Language – Attendees will learn the resonances of the Irish language and some vocabulary from an Irish speaking teacher. History – Themes will encompass the Celts and the coming of Christianity, the influence of the Vikings, and the origins and consequences of the Great Famine (1845-55). Dance – Irish traditional dance as well as step-dancing, will be demonstrated by dancers and the basic steps will be presented. Music – The bodhran, harp, tin whistle and bagpipes. Students not only hear the music, they learn about the instruments and their histories. Students will receive a tin whistle and learn to play a few notes. Sports – Hands on/and demonstration of Irish Football and Hurling provided by GAA Sports. Traditional Irish Food – Attendees will receive traditional Irish snacks during breaks. Students will have a bagged lunch, 2 snacks and beverages will be provided. Culture – The oral tradition and its contribution to Irish history is recounted through the art of storytelling.